Mashonaland East is located in the North Eastern side of Zimbabwe. The province borders with Midlands in the South, Mashonaland West in the North West and also Manicaland in the East. 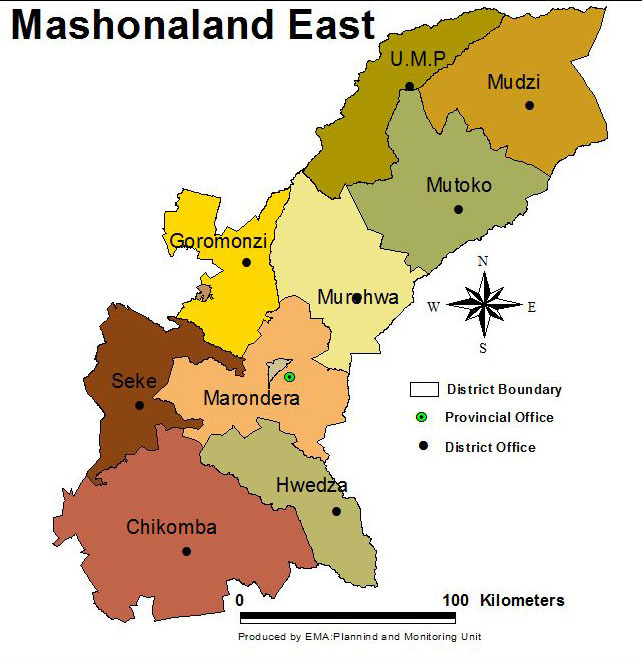 It also shares its borders with Mozambique and lies in the natural regions 3 and 4.Mashonaland East is mostly defined by the Mazowe catchment which is one of the seven famous catchments in Zimbabwe. The province has a total number of nine (9) districts namely Chikomba, Mudzi, Uzumba Maramba Pfungwe (UMP), Hwedza, Seke, Mtoko, Mrehwa, Goromonzi and lastly the capital Marondera. Population density is 42 people per square kilometre as noted by ZIMSTAT (2012). Mashonaland East is characterised by gleyic luvisols and deep Kalahari sands with low water holding capacity. Some parts of the province have sand, clay and loam of low inherent fertility but however, the soils are reliable for subsistence farming as it is commonly practised in most of the districts.The province is also rich in minerals which include granite better known as ‘black diamond’ in Mtoko. Chikomba district is better known with vast land mines and the common minerals found in the province include gold, berly, nickel and also tungsten. The forest cover in Mashonaland East is dominated by mutondo, musasa, mutsvonzvowa and also mukarati. Rivers in Mashonaland East and also the upper Mazowe catchment are highly polluted due to alluvial mining activities and exposure of water resources to toxic chemicals such as mercury and cynanide in Mazowe river which are dangerous to humans and livestock. Rivers have been reduced to rivulets mostly because of illegal mining as large tracts are dug up and large pits left each side of the river blocked with heaps of soil that can easily be washed away back into the river causing siltation. Due to fertile soils along the rivers and pressure on wetlands,the drying up of rivers and dams in the province is rampant. Siltation in Mashonaland East Province has caused water shortages and also conflicts between the humans and animals over water sources. Poverty has pushed many people to opt for small scale mining in the province. The artisanal miners better known as makorokoza however mix residual ore with mercury which is hazardous to both humans and animals causing slug. The activities of makorokoza mark river beds with deep holes and gullies where water collects in small rivulets that quickly dry up. The soil dug is washed away by rain, silting up the river downstream. The river banks, for instance of Nyaguhwu river are becoming severely eroded affecting water flow and the fertile land is affected hence less food production being produced. Villagers in UMP are facing serious water crisis as gold panning activities along the Mazowe river have negatively impacted on efforts to access drinking water. Some parts of the province have even dried up. Illegal mining has caused the drowning of cattle in open pits left from mining granite especially in Mutoko. Increased agricultural activities and the massive electricity shortages have put much pressure on Mashonaland East forests. Deforestation is rampant in Mudzi, threatening settlement and agricultural productivity hence the area is progressively turning into a desert. Deforestation has led to massive siltation of Mazowe river which is the main life support of the province. Poverty is the main reason behind land degradation in Zimbabwe at large. Tobacco farming is also eating up Mashonaland East forests. According to Forestry Commission, the expansion of agricultural purposes and firewood are the main sources of energy are drivers of deforestation. The cherry pie better known as the lantana camara is common in Mashonaland East. This invasive alien specie reduces the productivity in pastures through the formation of dense thickets which reduce growth of crops. It also changes fire patterns as it adds fuel load hence a fuel to veld fires. Unrestricted access to wetland by livestock is also affecting the status of wetland thus leading to extinction of ecosystem species and drying up of wetlands. Mashonaland East is characterised by part of Driefontein wetland, Songore wetland, Meza wetland in Mudzi and also Gutu wetland in ward 8 of Mrehwa district. For instance, in Mrehwa, people plant bananas, sugar cane and also fruit trees in wetlands and carrying out agricultural activities in wetlands is a prosecution as this leads to degradation and depletion of wetland due to siltation and erosion. Lack of fertile land in some parts of the province has forced people to turn to stream bank cultivation. People prefer stream bank cultivation due to poor terrain which only leaves them with no option of practising river and stream bank cultivation where they find fertile soils especially along Mazowe upper catchment. Mudzi is now exposed to dry spells and failure of crops due to stream bank cultivation. Ward 7 in Mudzi district is prone to rampant to stream bank cultivation. This is due to lack of environmental awareness threatening the life of Mazowe river due to siltation thus disturbing normal water supply and flow from tributary rivers such as Ruya and Dzomutizo rivers hence the water sources are drying up. Seke district is much known of veld fires especially in the resettlement farming areas under the Manyame Cluster. Large tracts of land are being destroyed and vegetation hence a threat to human life. Veld fires are multi-faceted and a threat to the bio-physical, social and economic environment. Major culprits of veld fires are poachers and also farmers clearing land for agricultural activities. A number of deaths due to veld fires in the province have been recorded.